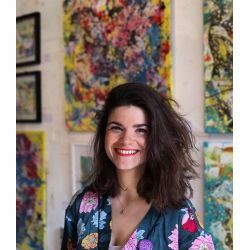 My name is Anne-Claire Fleer, the ‘girlboss’’ behind Art by Anne-Claire Fleer. I’m a Dutch born, London-based, bold and energetic human being with BIG dreams. Most days you can find me.. But I didn’t always have this business: it was only a few years ago that I went From Corporate to Creative. I always dreamed of becoming this successful business women wearing high heels and carrying around her briefcase. Until I unexpectedly burned out. For the first time in my life I took time to slow down and started paying attention to two things: what gives me energy and what drains my energy. This is when I rediscovered my love for art. Now I’m proud to say that I’ve successfully transitioned from working in IT and Finance to being an international selling and exhibiting artist and body painter. Besides my daily art activities I’m here to inspire more people with motivating stories about choosing a lifestyle over a job or career. This I do by sharing personal stories as well as guest blogs by other full-time creativepreneur that left their corporate jobs. As an HSP (Highly Sensitive Person) having gone through a burn-out, now living the best version of my life, I feel it’s my duty to share with you how I got here and continue to look for ways to make it even better. Additionally I’m here to share business tips and tricks with fellow artists (creative gal with a business mind you see) and last and most importantly support my art collectors making the right decision when purchasing art. Ever since I started this journey I’ve been sharing most of my daily activities through my Instagram, so click here to follow me chase my dreams.